How do I create and edit a Wiki in MyBeckett? Wikis allow you to communicate and collaborate with either all of your peers in a module, or a group of your peers from within the module. You may be asked to do this as part of an assessment. There are two different ways Wikis can be accessed depending on how they've been set up by your tutor. This type of Wiki allows anyone studying the module to contribute. Enter the module and locate the Wiki icon. If you can't locate it you'll need to contact your module tutor to ask them if they're using it and if so, where it's located. Enter your Sub-Group. This may be under the My Sub-Groups in the module navigation menu, or it may be in a content area. If you can't find it, please contact your module tutor to confirm the location. Inside the Sub-Group you'll see a list of Properties, Tools and Assignments. 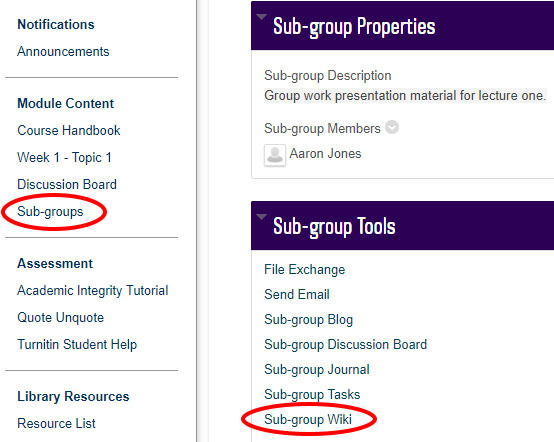 Access the Sub-Group Wiki from the Sub-group Tools section. The first time you access a Wiki you may be asked to create a new homepage. Or, your tutor may have already created a page which contains info about what they expect from the Wiki. If you're asked to create a new homepage, enter a name and the contents of the homepage in the relevant boxes. These can be changed at any time by editing the page. You'll be taken to the Wiki editor. Click the Create Wiki Page button. Give the page a name and add some content. Click Submit when you're finished. You can navigate between pages using the Wiki Details menu on the right of the page. On the page you want to edit, click either the Edit Wiki Content button or click the arrow next to the page name and click Edit. The Wiki editor opens. Make your changes, then click Submit. The changes are shown in the Wiki editor. A Wiki allows you to view edits made to a specific page. Find the page in the Wiki Details menu on the right, click the arrow next to the page, click History. You're shown a list of page versions. Click a title to view different versions of a page. To compare changes between two versions, tick the box to the left of the version names and click Compare Versions. You're shown the versions with page changes highlighted.